An insatiable desire to search for spices! Did you hear the good news? Your child can be one of the first Europeans to see lands he didn't know existed. He'll sail the high seas with courage and love for queen and country, stick the Spanish flag in whatever ground his ship hits first, and become immortalized as a polarizing historical figure. It all must start somewhere, though. 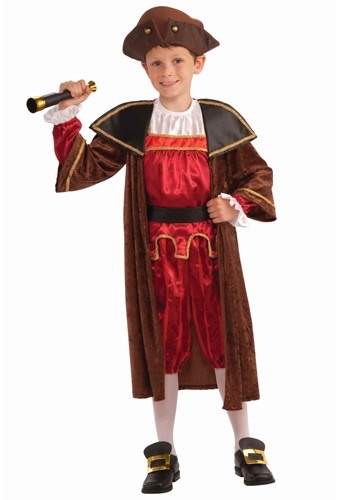 When your child steps into this Kids Christopher Columbus Costume, he'll probably go out into the neighborhood with haste, recruiting hardy explorers willing to travel the world in search of new passages to new lands. Sure, it may begin on bicycle and their expeditions may extend only as far as dinnertime will allow, but imagine the possibilities even within those limits! Over spaghetti and a tall glass of milk, he may start speaking with great interest and knowledge about exotic spices and known seafaring routes from Spain to India. But don't worry, unless he finds his own Nina, Pinta, and Santa Maria he'll likely be home in time for bedtime and forget all about Hispaniola. This costume features gold trim a-plenty, satin pantaloons, and decorative gold buttons to please the queen before and after he's amassed a treasure trove of spices, knowledge, and scurvy!